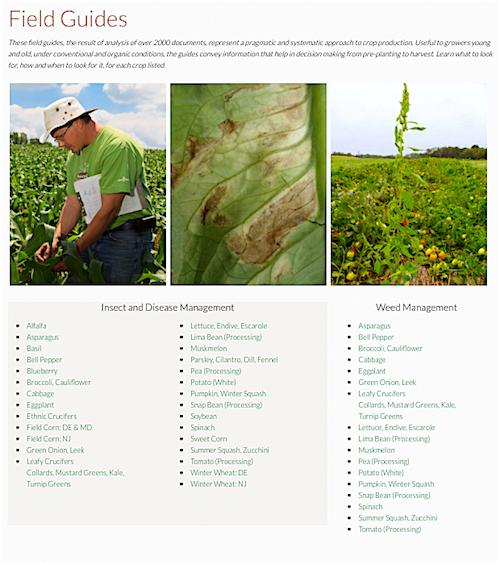 The Plant & Pest Advisory serves NJ growers by reporting on important pests and recommending responses that are grounded in reproducible trials. Articles in this section contain information helpful to the NJ commercial organic grower. Sharing organic practice trial results between land-grant universities is a cost effective way to create a common knowledge base built on the strengths of individual programs. In the sidebar, find institutions with programs in organic agriculture which augment knowledge developed at the Rutgers New Jersey Ag Experiment Station. Rutgers Cooperative Extension Field Guides: These concise guides help with decision making from pre-planting to harvest. For each crop listed, learn what pests to proactively look for as the season progresses, how to look for them, and when to take action.